She Who Must Be Obeyed loves salmon. This recipe is one of her favourites and I have done a post on it before. However, I never included the recipe in Yummly format so here it is. I do point out this is not my recipe although I have adjusted it to our taste and converted it for our smoker. We have it on an old recipe card and don’t know who created it. If you do, let me know, I would love to give them credit. You heat it all until the sugar is melted, cool it and put the salmon in it overnight. Rinse the salmon off and dry it with a paper towel. Rub the salmon with a couple of tablespoons of honey. Then press in peppercorns that have soaked in hot water for 15 minutes. 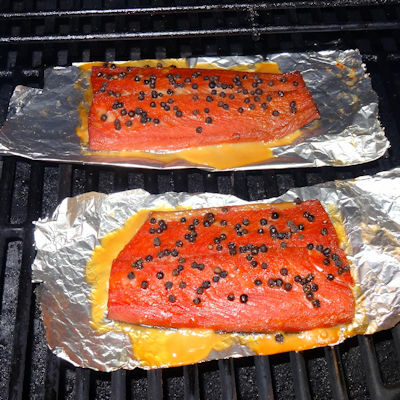 Put the salmon on small sheets of foil. Preheat your smoker or oven to 200 F. I used my Louisiana Grills pellet smoker with apple pellets. The smoke really adds a great flavour to this salmon but you can get a nice result in the oven. 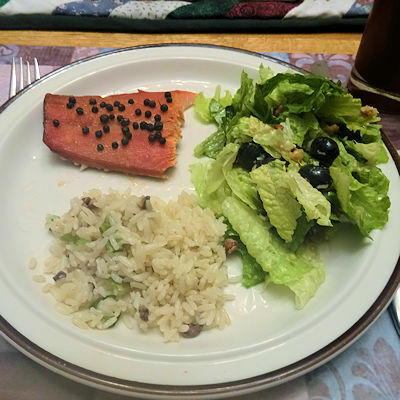 We served the salmon with a green salad and some rice. This salmon is not a light flaky salmon. It is denser and heavily salted and flavoured like smoked salmon. The peppercorns add a great flavour to the meat. I brush most of the peppercorns off when I eat this but She Who Must Be Obeyed happily crunches on most of them. Perhaps someone can explain to me how someone who says they don’t like very spicy food eats peppercorns? Make a brine by mixing the water, brown sugar, salt, ginger, bay leaves, and allspice and heating the mixture until the sugar dissolves. Pour the brine over the salmon and let it marinate in the fridge overnight. Put the peppercorns in hot water for at least 15 minutes. Spread the honey on the salmon. Press the peppercorns onto the surface. 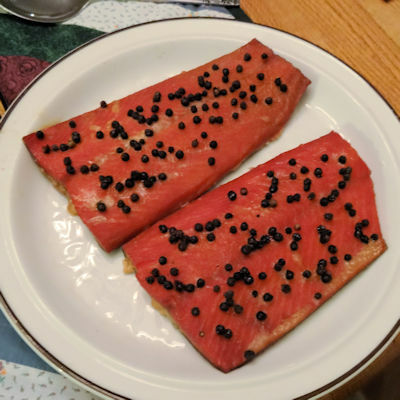 Cook the salmon for 2 hours in a preheated 200 F smoker or oven. She Who Must Be Obeyed has good tastes, this looks delicious! Fortunately, her good taste doesn’t extend to her choice of husbands!